Most likely a new Brewfast reward. /awaits the inevitable "yo dawg" involving this and the pony keg. Yo dawg, we heard you like ponies. So we put a pony in your pony-keg so you can drink whilst you ride. Yo Dawg, We herd you liked ponies, so we tied Ghostcrawler to a keg, and attached the keg to a pony so you can drink when you ride, and %^&*! about ponies while you drink. Maybe Metzen has a thing for ponies. Available for 200 Ficha para la Fiesta de la Cervezas from Belbi Tiratrastos or Blix Chirimbolo during Brewfest. EDIT: thank you for disliking my comment for absolutely no reason, noobs. I think you mean a Krewfest Peg Bony, occifer. No no no. It's a Prewfest Kony Beg. Get it right people. Jeez. And I shall name you, Fluttershy. ...if that's all right with you. @ Keg Pony - best item from Brewfest right there. Welcome to the herd! Six NPCs on ponies need to be programmed to sing this at Brewfest. I-I think I love you. Truly epic my friend, truly epic. Words cannot express my love for you right now. I was having trouble deciding if I should get this or the regular keg first; I now know what I must do. And it shall stay in my vanity bag forever. This is not a Mount or a Companion Pet. Friendship just hit the fan, and it's painting the internet pony. I don't quite understand, why Blizzard did not decide to make this Pony Keg Pony like the Paje de hermandad or Heraldo de hermandad, they both have a cooldown on summoning and a limited lifetime once summoned. I really hope they retro-fix that to allow us to learn how to summon it, i. e. not wasting a bag space on this thing. 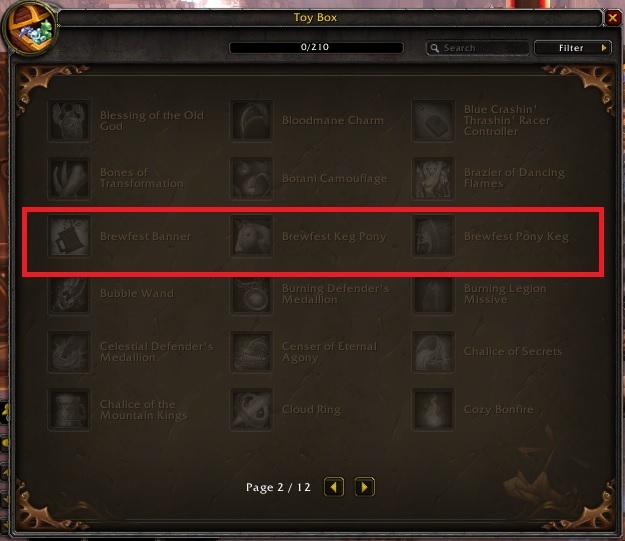 Edit: With Warlords of Draenor and the Toy Box, both the Keg Pony and the Pony Keg find a new home without consuming your inventory space. It takes 5 Cerveza de la Fiesta de la Cerveza to get you completely smashed. I did it for the science! ... hic! Now some coffee, pleashe? Both those pets have a practical purpose, as mobile vendors both for buying but to sell stuff as well. The Keg Pony is purely a novelty item, so really can't be compared equally. The Pony Keg was not learnable as a pet, so why should a mobile version be any different ? So in other words, you want 1 more to count towards your pet achievement so that you can get your Celestial Dragon. Don't buy it if you don't want it. This is for us drunkards that slave drive little ponies to carry alcohol with us rather than carrying a stack or two in our bags. It's intended to be a cooler version of the pony keg, not a companion. They're called vanity pets for a reason. Just uploaded a screen shot of the keg pony! he's cute - shame he's not technically a companion pet though, shame for him to take up a space in your bag! It will take the effect of Papa Hummel's Old-Fashioned Pet Biscuit for it's duration. Wait a beast in am mythological game that was around far before a show based on the animal? OMG ALTHOUGH IT'S UNRELATED IT'S TOTALLY GOTTA BE A REFERENCE! This little guy is considered a non-combat pet however it will not stay out permanently as the description says it only lasts three minutes and I can confirm that the Galleta de mascota retro de papá Hummel do in fact work for its duration. You beat me to the comment! I can't put into words how happy I was when I clicked the biscuits and it worked! First of all, Lil' Ragnaros is a mobile campfire, which is a not very practical since they take 0 mats now. So you're argument that they have a practical purpose and thus should be vanity pets is moot. And since when does a pet need to have or not have a practical or funny use to be considered for vanity-dom? Shoot, Nuts hits you in the head with acorns, if that ain't an impractical ability for a pet i dont know what is. And secondly, you said that the Guild Page and the Herald are vanity pets, but you also say that ponies with kegs on there backs aren't tameable (im assuming you mean for hunters). This is idiotic since that would mean i can go out and find a midget orc child to tame as my hunter's pet because i have an Argent Gruntling, or that baby dragons should be tameable by hunters. It isn't asking for much to let the Marionette and the pony be vanity pets. Pony friendship is magic? Wrong. Pony beer is magic! This 'pet' makes the Cuñete de la Fiesta de la Cerveza completely obsolete, except for the separate cooldowns. It has all the same effects: right-click gives unlimited Cerveza de la Fiesta de la Cerveza for 3 minutes, until the 30 minute c/d kicks in. The keg however does not conveniently follow you and your friends around. You'll probably blow both C/Ds one after the other and wait 27 minutes anyway. If you have patience, and ram racing luck, then go ahead, I guess... otherwise, skip the keg, get the pony. Or worst case scenario, you haven't done dailies or ram racing enough and cant afford 100 more tokens, do get this. If only it was a mount...then gnomes would finally have something their size. I am such a huge fan of your work. You, nhym, oxhorn, abandonationz, gigi, i love all you guys. If you ever make a character alli-side on Dentarg(US), add me to friends, my name is Xkcd, and my guild, atm, is Dentarg Pugs. I prefer Krewfest Kony Keg. Why on earth did this get ranked down? and i just subscribed epic song, was hard hearing it (being i hate MLP) in my head... found some other good parodies as well... hope this "bump" gets you some more people to check out your channel and some subscribers... Keep it up. Props for actually crediting and picturing a screen shot of the original posters lyrics. lol and i just went the long way without even looking at the very next post to see if there was a link to the video.... oh well... shows im the take action type... guess thats a good trait being a bear tank! does'nt share a CD with the Pony Keg, drink up me earties' yo ho! The Brewfest Keg Pony WILL play fetch using the 'Fetch Balls' in Dalaran. It can also be made happy with the pet snacks, washed with a pet bath, and leashed with pet leashes. I hope its filled with cider? I'm glad you all had such a good time with your keg pony. I grinded Brewfest for a week to get this. Once I got it, of course I immediately summoned it. It was there for 1/2 second & disappeared. No free beer :( I deleted it because it's a waste of bag space and complained to Blizzard. Too bad they didn't add this to the unlimited pet slots. This is the worst thing I've ever worked for in the history of the game. Did anyone else notice that after 3 minutes of carrying your kegs this pony DROPS DEAD? Poor Bill. Just an FYI, using one of the Darkmoon Faire temporary rides (such as Darkmoon "Snow Leopard") after summoning the Brewfest Keg Pony, will then cancel the Brewfest Keg Pony. However, using one of the Darkmoon Faire temporary rides first and THEN summoning the Brewfest Keg Pony will NOT cancel the Darkmoon Faire temporary ride. If you summon a pet then this pony will disappear. 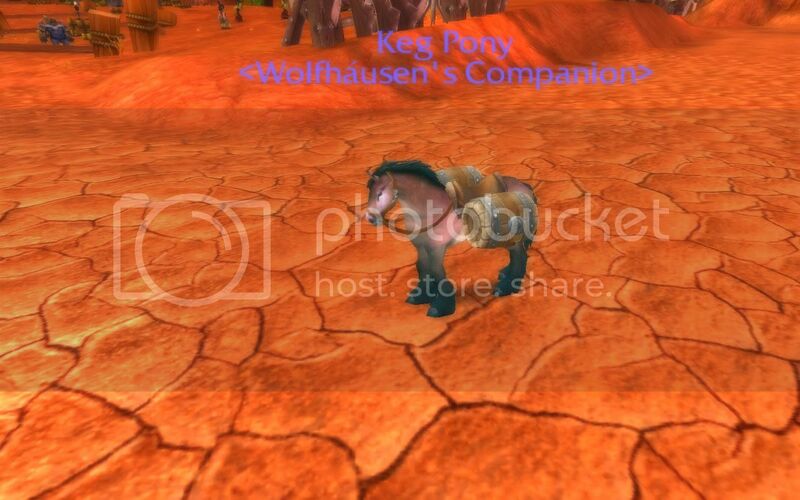 Why don't they transform Brewfest Keg Pony to a normal battle pet ? This will be useful . After all , its passive abilities are pretty similar to Alterac Brandy . Why not ? Don't use it in bg if you are a rogue cause it will follow you and the others may know where you are. Much to my surprise this item is eligible to be used with Espejo de mascota mágico and if you use it with Cuerno de beber vrykul, you can enjoy 10 minutes of being a semi-big Brewfest pony. The counterpart of the Cuñete de la Fiesta de la Cerveza. I prefer this one because it follows you on your travels! Also, just with the Cuñete de la Fiesta de la Cerveza, your party members can click on it for beer as well. If you want to see it in action before dropping 200x Ficha para la Fiesta de la Cerveza on it, I made a quick video showcasing it. Poni cervecero de la Fiesta de la Cerveza is one of seven unlimited-use drinking items available in game. Poni cervecero de la Fiesta de la Cerveza is sold by Brewfest vendors for 200 Ficha para la Fiesta de la Cerveza during Brewfest. Última jarra de Lao-Chen - a quest reward from ¡Rodarán barriles! in Cima Kun-Lai. Brebaje de Jin Barril Caliente - a quest reward from Refugiados in Cima Kun-Lai. Kit de cervecero ogro - a guaranteed drop from Vapuleador Kreego, a rare mob found in Gorgrond (location: 38.2, 66.2). Barril misterioso - a quest reward from Limpiar la casa (A) / No en tu ejército (H) in Cumbres de Arak. Cuñete de la Fiesta de la Cerveza - sold by Brewfest vendors for 100 Ficha para la Fiesta de la Cerveza during Brewfest. Morral de cerveza pandaren - sold by Brewfest vendors for 100 Ficha para la Fiesta de la Cerveza during Brewfest. Recompensa de la cosecha (creates Pan de la cosecha) - mailed to players after completing En honor a un héroe (A) / En honor a un héroe (H) during the Harvest Festival. Esqueje de sotoespora eterno (creates Vaina de sotoespora) - item is now unobtainable. Sobras perpetuas - contained in Delicias de Nomi which is a quest reward from Una muestra de aprecio. Flor generosa de Ba'ruun - a guaranteed drop from Ba'ruun, a rare mob found in Valle Sombraluna (location: 53, 16). Comida de Talador sabrosa - contained in Lonchera del capataz, a treasure found in Talador (location: 57.39, 28.66). Brebaje de champiñones de Stygana sin fondo - contained in Alijo de hongos Foso Sangrante, a treasure found in Selva de Tanaan (cave entrance: 44.6, 77.5 / treasure location: 49.9, 76.8). If you don't wanna wait until the Brewfest to throw a party, you can buy an Alterac Brew-Pup and have fun getting smashed with your friends.